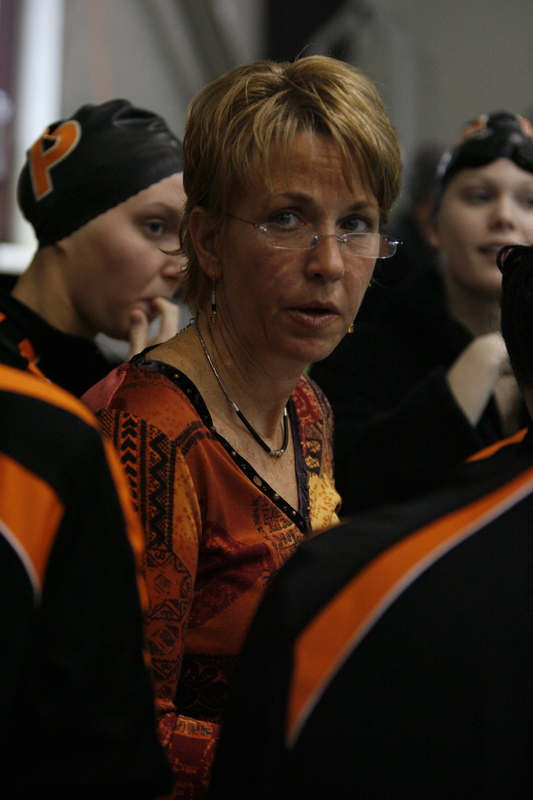 Susan Teeter recently retired after her 33rd season as the ultra-successful head coach of the Princeton women’s swim team and 40th year in coaching. While at Princeton, she was the all-time leader in wins, Teeter has racked over 224 dual meet victories, and she guided Princeton to an incredible 17 Ivy League titles. Teeter is the Ex-officio President of the College Swimming & Diving Coaches Association and awarded USA Aquatics Sports Most Outstanding Woman for 2015. Currently Teeter serves as the Leadership Coach and Volunteer swimming coach for the Rider University Men’s and Women’s swimming teams. She also created and runs a Leadership program for the captains of all sports at Princeton University and if a special consultant to the USA Swimming National Team Director. Now this newly “coaching retired” leader has quickly become the face and the voice behind changing the look of women coaches in swimming. Based on her coaching record, passion for building young women into strong women and her outspoken nature, Teeter can be found leading the charge to help change USA Swimming and College Swimming in how women are hired, viewed and appreciated. Teeter is currently serving as a consultant on women and leadership in swimming to USA Swimming and the National Team. Teeter is also passionate about helping save men’s swimming programs from being cut at NCAA schools and helping to keep college programs as separate men’s and women’s teams vs. the “combined program”. During her time coaching at Princeton, Teeter had a seven-season winning stretch, her teams won a Princeton-record 47 consecutive meets, a streak that ended in 2004 at nationally-ranked Pittsburgh. Princeton also won five consecutive Ivy League titles during that time period (2000-04). While individual successes become a regular part of Princeton’s recent dominance, Teeter proudly always pointed to the team successes. Her peers took notice of Teeter’s place in the sport. She was honored with the prestigious College Swim Coaches Association “Lifetime Achievement Award” in 2011 and in 2017, the “National Collegiate + Scholastic Trophy“, the highest award given by the organization. Teeter earned the American Swimming Coaches Award of Excellence multiple years, including five straight years from 2006 through 2010. In 1988 she received the Master Coach Award from the College Swimming Coaches Association for her contributions to collegiate swimming. Teeter has mentored swimmers who went on to become Olympians, NCAA qualifiers, All-Americas, senior national/Olympic trial qualifiers, World University Games team members and Ivy League champions. Teeter is a member of two Olympic Teams, spending the summer of 2000 serving on the U.S.A. Swimming staff in Sydney as an Assistant Manager and the summer of 1996 as the Head Manager of the USA Olympic Swimming Team in Atlanta. In all, she has been on the staff of nine international swim teams. From 2001-2008 she served as a special consultant to Speedo USA for all Olympic and World Championships. In the winter of 2000, Teeter’s senior class established and endowed the Susan S. Teeter Award, which is given annually to the senior class swimmer who, during her four-year career, distinguishes herself as an outstanding student and a valuable member of the women’s swimming team. Teeter has also been honored by past graduating classes by being named an Honorary member of the Princeton Classes of 1985 and 1986. Teeter serves as a Certified Professional Behavioral Analyst and a Certified Professional Values Analyst. She works with sports teams as well as small businesses to improve the quality of their staffs, programs and communication. Through her work, Teeter has become known as one of the great TEAM Builders in College Swimming. Teeter is also a Certified Life Coach receiving her certificate from the International Coaching Society and a certified Tim Elmore “Habitudes Facilitator”. Teeter now speaks with teams and leads leadership workshops on a regular basis. In 1999 Princeton University’s President’s Standing Committee on the Status of Women recognized Teeter for her contributions to women on campus. Teeter is also known for facilitation work while working with women’s growth weekends for the East Coast Sage Circle. Teeter is a graduate of the University of Tennessee, Knoxville graduating with a BFA. She is a level 5 USA Swimming Coach.